Reagan has come a long way. She and her littermate were dropped off at Upland Animal Shelter in Upland, CA, covered with fleas and ticks, and now she’s well groomed and prances with seeming delight when people talk about how cute she is, says Rebekah Cherniss of Fontana, CA, who adopted her. Reagan is always eager for a walk. The Chernissses saw Reagan, then called Muffin, on Petfinder when they were dealing with the death of their beloved dog, Baylee. Shortly after, they went to an adoption fair and, though they looked at many dogs in their pens at the event, none felt right. They decided to go to the Upland Animal Shelter to meet her. They rounded one more corner, however, and there she was, sleeping on a table. She was recuperating from being spayed the day before. 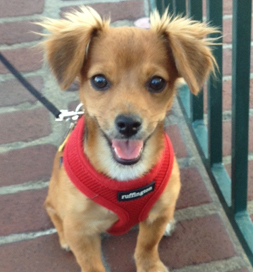 The little Chihuahua/Dachshund mix has become an unofficial “Chiweenie” Adoption Ambassador, Rebekah says. “We have been able to explain her mixed breed and shelter origin to many people while we’re out on our walks. ” She is a cutie, so it’s no wonder she won the top prize in a local cute pet contest and was a runner-up in her ladybug costume at a Halloween costume party. She has completed the AKC Good Citizen program and attends a Puppy Playtime at a retail pet store. Her other interests include hunting for “badgers” (really gophers), riding in her bike basket or car, camping and hiking, and just snuggling on the couch, warm in one of her little sweaters. “We love her so much,” Rebekah says. “We are thankful that the shelter saved little “Muffin” so we could have our Reagan.” Her adoption day made the Cherniss family complete once again.